The cast of Bualadh Bos's production of The Cripple of Inishmaan. IN 1934, on Inis Meáin in the Aran Islands, there is great excitement when news arrives that a Hollywood film is being made on the neighbouring island of Inis Mór. The one person who wants to be in the film more than anybody is young Cripple Billy, who yearns for a shot at stardom, and who desperately wants to break away from the bitter tedium of his daily life. 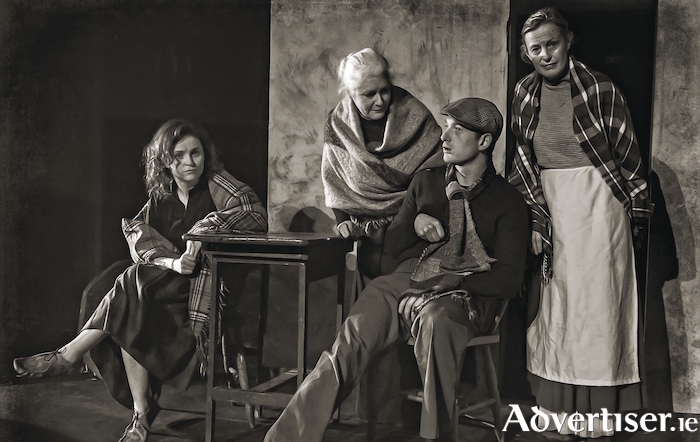 This is Martin McDonagh's brilliant The Cripple of Inishmaan, which will be staged by Oranmore drama group Bualadh Bos in An Taibhdhearc tomorrow and Saturday at 8pm. The production follows Bualadh Bos's three sell-out shows in Oranmore. Tickets are available from antaibhdhearc.com and 091 - 562024.